Prostitutes - Aluminium Garage. Vinyl EP. Bleep. Since his 2015 Night School debut E.P. Nouveauree, James Donadio - aka Prostitutes – has been traveling stages and rigs from Los Angeles to Berlin, from prestigious festival slots to slimy Glasgow basements, burning his own path through the modern techno and electronic scenes. 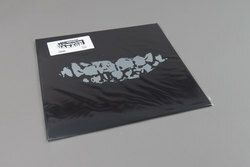 On Aluminum Garage, Donadio is at his most playful, laying down unmistakably mid-tempo BPM early-electro jams indebted to early sampling before crashing the soundsystem with frantic, detourned Gabber. Unlike his previous LP for Spectrum Spools or indeed his Night School debut which rankled with austerity and minimalism, here Prostitutes is instinctive, multi-layered and unashamedly, brilliantly borrowing from myriad genres. In past 3 years, Donadio has racked up critically praised releases on labels like Diagonal and CGI, refining his wares into a precise, bludgeoning toolkit that surprises and develops with each release. Aluminum Garage creeps into life with Born Wanderer, before a sub-heavy kick and bongo pattern blasts into a heavy break that feels like the earth moving from under your feet. With the utmost clarity, the track builds disparate layers – a white noise solo, warped sample piano chords straight from 1986 – into a Rave-o-matic climax, holding steady with the BPMs and immeasurably funky. Jah Elegant further blows apart any image we have of Prostitutes’ music as “austere” with a loping intro based on teased drum samples and a ghost MC. The Jungle break comes in by stealth before the heavy drop blasts the music into Drum + Bass momentum. It’s both blistering fun and undeniably cheeky, a driving track that cuts up Remarc on a dimly lit table in suburban Ohio.